Students received gift donated from community organizations. BUFFALO, N.Y. — Students at Enterprise Charter School celebrated Christmas early on Friday morning. As part of the Buffalo Christmas Wishes Gift Distribution, the students received presents from the Little Match Girl Foundation. The hallways of Enterprise Charter School were filled with the sounds of children screaming for joy and wrapping paper being ripped away from gifts all morning until just before dismissal; when students carted their gifts onto the school buses and rode off to enjoy Christmas break. One of those students was third-grader Yoanys Bruno. She received, among other things, a Nickelodeon slime kit. It's something she says she really wanted, but wasn't sure she would be getting this Christmas. "I feel happy and I'm grateful", Bruno said. Bruno is one of more than 200 students at Enterprise Charter School to receive a bag of gifts this year. Faculty and staff began planning for the gift distribution back in September. 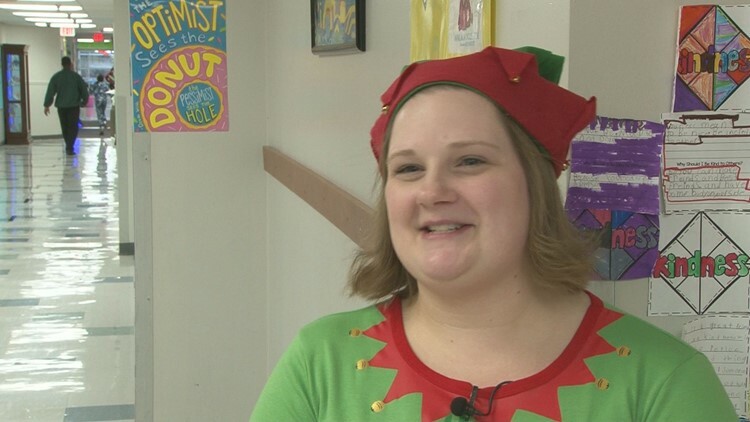 Erin Catalano spent months preparing for the Friday's gift delivery along with dozens of staff and volunteers. Erin Catalano, a special education teacher at the school, oversaw the planning and preparation. She spent weeks checking lists of donations to make sure each student received things they needed and wanted in their gift bags. Catalano even held a wrapping party, where volunteers spent hours wrapping the gifts going into each bag. She says the most gratifying part of the day was watching the students open presents. "It's my favorite day of the year," said Catalano. "I can't talk about it without crying. Just to see the looks on those faces when they open those gifts." Those presents were largely due to corporate sponsors, including Gerber Ciano Kelly Brady, LLP. The law firm has provided gifts to the Enterprise Charter School for more than a decade. The initiative started in 2005 with a gift-giving program that evolved into the Little Match Girl Foundation, which was founded by Brian R. Biggie in 2014. The foundation aims to provide necessary supplies and gifts to communities in need, in hopes of providing as many children as possible with the joy, wonder and optimism of youth. The Little Match Girl Foundation has expanded to serve communities throughout Buffalo, Philadelphia and Chicago.